My wife and I had the best time ! We're pretty well traveled but this was one of the best experiences we've ever had. We hired a porter which was totally worth it. The hiking was hard but you really feel accomplished. Our guide Paul was amazing ! I couldn't imagine a better guide. It was an incredible experience and I would recommend it to everyone. 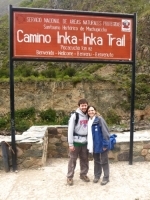 The hiking was amazing and the guides and people really made it special. 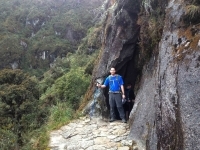 I felt a great sense of accomplishment by reaching Machu Picchu and climbing Huayna Picchu. 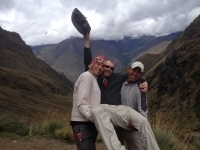 My experience with Inca Trail Reservations was excellent. 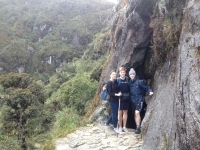 Our guide was very knowledgeable and humorous, he made the whole trip thoroughly enjoyable. Every meal we were served was absolutely delicious and the chefs were excellent in providing us all with a great variety. It was particularly nice being served traditional Peruvian food. 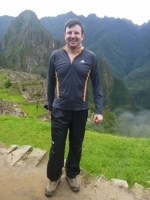 Machu Picchu was a once in a lifetime experience. Which was only made better by the incredible team and guide we had. The views and scenery were like nothing I had ever seen and the hardest part was trying not to walk off the cliff as I was constantly staring at the mountains. 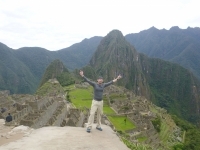 When a friend of mine invited me to come along a South America trip, including a 4 day trek, I agreed without thinking twice. After finding out a porter wasn't carrying my bag as I was told, I still brought my entire traveling bag. It was an amazing experience and I would do it again in a heart beat. I was not expecting the meal and tent service that we had and it was over the top fantastic. 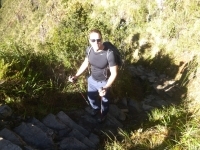 Our guide was knowledgeable and friendly and he went above and beyond to help us through this trek. 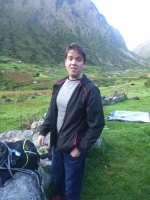 My Inca Trail experience was absolutely amazing and incredible. Everything from my briefing with the guide the night before, to the pickup and drop off was great, and the staff couldn't have been better. Our guide was friendly, knowledgeable and went above and beyond to help us with whatever we needed. This was an awesome trip. Group was great. Staff, porters and chefs did amazing job. Manny, our tour guide was very informative and helped us along the trail. Everything went smoothly. He made the adventure worth while. The food was exceptional. It was amazing that the chefs could prepare three course in the middle of the country. Foi uma experiencia unica, fantastica e inesquecivel! 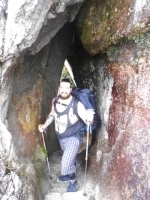 A mistura das ruinas Incas com a natureza exuberante das montanhas e um caminho que realmente nos faz lavar a alma e libertar a mente. 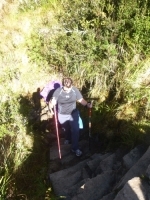 A chegada a Machu Picchu e o ponto alto da trilha, mas em toda caminhada a paisagen de rios e montanhas sao igualmente incriveis. Great experience ! Due mostly to Manny and Marco. They both went above and beyond. My first day was very rough (make sure all restaurants thoroughly cook your eggs). I had to rent a horse about halfway through the first day then sleep, sleep, sleep. The whole time Manny knew what to do. 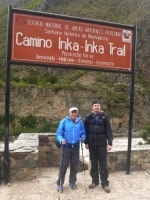 Having never been to Peru before and not knowing what to expect, I was pleasantly surprised when we arrived at Inca Trail Reservations. All the staff was very polite and helpful. By the time the trek started everyone was geared up for the journey !